If you haven't already submitted something please take a couple of minutes to draw a quick napkin sketch for the 2nd Annual AIA Tampa Bay Holiday Party Napkin Sketch Competition. The winner will receive a free local AIA membership! (Associate=$60, Full=$150) We had a bunch of great submissions last year and look forward to seeing your sketches again this year. Please drop your sketches off at the AIATB office by the new submission deadline of 5:00PM on Wednesday, December 5th. The gallery opening and holiday party will be at 6:00PM on Friday, December 7th. Will this be the new home of the Tampa Bay Rays? 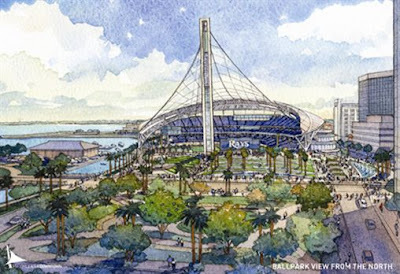 A street level view from 2nd Ave. S.
On Wednesday, the Tampa Bay Rays revealed their plans for a new stadium along the waterfront of downtown St. Petersburg. It's no surprise the HOK Sport is involved with the project, but what is slightly surprising is that they are going for the now typical retro look. 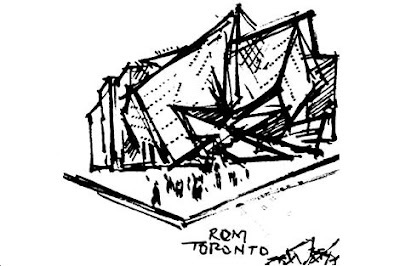 The proposal includes a very tall mast and an innovative cable-stayed roof system. See more at the links below. HERE is the Rays official website dedicated to the proposals. HERE is the St. Pete Times' special page that is dedicated to their coverage of the proposed stadium plans. The city of Tampa is considering selling naming rights to the Tampa Convention Center to increase revenue. 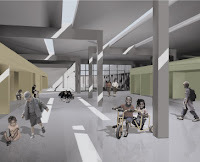 This Tribune story discusses the consideration, as well as the naming of spaces in other civic buildings (like the New TMA) or entire buildings (like the Glaser Children's Museum.) In a city already feeling budgetary constraints from tax reductions, and with a smaller base of support for cultural and arts programs than many other metropolitan areas, is this a creative way to boost funds? Is this a crass commercialization of our urban fabric? Or are we so far mired in 'Raymond James' & 'Tropicana' Stadiums and 'Tostito' Bowls, that it no longer matters if we sell off our remaining buildings as billboards? By now most of you have probably heard that the Tampa Bay (no longer Devil) Rays are looking to build a new stadium along the waterfront in downtown St. Petersburg. There are two major parts to the deal. 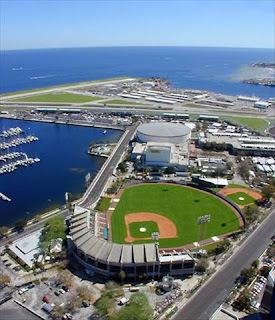 The first would be building the new stadium on the site of Al Lang Field (pictured), the current spring training home of the Rays. The second part of the deal would be the sale and redevelopment of the 70-acre Tropicana Field site. I think that both would be HUGE benefits for St. Petersburg. Having the stadium in the heart of downtown could generate a ton of revenue for downtown businesses. 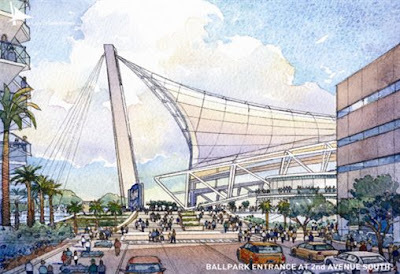 While the new stadium would be great, I think that more important issue is the redevelopment of the Trop site. It could be incredible if it was done correctly. It would be an opportunity to build a significant amount of affordable and attainable housing, which by the way, was the original plan when the City demolished the historic African American neighborhood that once stood on the site. People have mentioned the Atlantic Station project in Atlanta as a precedent. This worries me quite a bit. Not only because AS is filled with bad architecture, but also because for the most part it is proving to be a failure. I would point to something like the Orestad project located just outside of Copenhagen. Only the first phase has been completed so far, but there is a great attention to detail in the design of the infrastructure and public realm at Orestad. In fact, the City of Copenhagen gave the Orestad land to the developer for free in exchange for building the city's entire new metro system. What do you think? What should happen? Can a downtown stadium and 70-acre redevelopment be the impetus that Tampa Bay needs to build a mass-transit system? See articles from the St. Petersburg Times HERE, HERE, HERE, and HERE. RFQ happening for Kiley Gardens? It seems Kiley Gardens will be rebuilt but by minimal standards. What I do know is that there will be a true rooftop garden application (similar to the one used on at Rinker Hall at UF) which is exactly desired because a lot of the older leak problems related to poor construction. Further, I believe that the fountains/runnels will return though I am not sure how many. I do know that this project was suppose to be started in January and will be completed by October of 08. I am going to attempt to find out more about the project, do a site visit today. If landscaping is going to be cut back (which is my gut feeling) I do have the original list of plants/trees that were intended for the park, found that list this morning. I also have a contact that is willing to donate some plants/trees if that possibility comes up. If anyone has further information, ideas or some more insight please contact at me at cmvela311@yahoo.com or post below. Earlier this year I was sitting in my office on a conference call with the steering committee that was developing the 3rd Annual AIA Florida Emerging Professionals Conference. 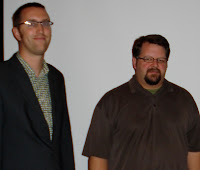 I suggested that we invite the guys from PLY Architecture to speak as the keynote speakers. We culled together a list of up-and-coming firms and decided on PLY as our top choice. Eventually, Kim Headland, the chairperson of the committee called up to Ann Arbor and invited Craig Borum and Karl Daubmann to speak. Quite unexpectedly, they both agreed to come down to lecture. Fast-forward six months and now I’m at the Lido Beach Resort in Sarasota, Florida. I’ve just arrived at the hotel after driving about an hour south from my home in St. Petersburg. I check into the conference and grab a quick bite of breakfast from the continental breakfast. I see Craig and Karl working away on their laptops in the lobby trying to put the final touches on their presentations. I had been emailing with Karl earlier in the week and had arranged to set some aside some time during the conference to interview them, so I quickly introduced myself and told them that I was looking forward to sitting down with them to talk. Phillip Crosby: You’ve talked about automotive manufacturing and obviously being up in the Detroit area gives you some unique opportunities. In your lecture you touched a little bit on it in terms of slipping in on the weekends to use the water-jet cutting. Could you talk a little bit more about what sort of partnering opportunities you’re looking at in terms of subcontractors or manufacturers? Karl Daubmann: I don’t know that it is so strategic in that we’re seeking those things out, but it seems like, well, like in the same way that practice is pretty tactical it depends on what projects you get and how those things go. Then it just seems like having to be aware of those things and tied into those things. You start to think about who you want pull in on a project to work on something. I don’t know if there are specifics, but for a project that we’re doing “it’s like oh well it would be interesting to try to work with that person.” So lets either wait for a project to come along where you can do that or you try to steer a project, the design of a project, in a way that might be able to tie into that or work with someone. That was the case with Rick. I don’t know that we’ve done it any other times. PC: Rick is the machinist that did the wall cap on the Mies plaza? Craig Borum: Yeah, I think that’s true. It’s more tactical. The actual relationships are more tactical. I think the inspiration is knowing what’s there. Knowing the organizations and how they work from the actual big three down to a whole series of outsourcing to smaller companies that are producing individual parts. Knowing what is on the ground gives us a certain way to start thinking about projects. But I think probably what we are finding more is that a lot of the small outsourcing pieces that we’re doing, just in terms of the equipment and stuff, are just cabinet shops and sign shops that actually have all of the equipment and have had it for longer than we’ve been thinking about it. You just realize that they are there and you have a whole new source. The auto industry is like a big shadow or big cloud, but the realities are that a lot of the things are pretty straightforward. They’re simple pieces of equipment that we’re using that are pretty widely available and people just don’t realize it. KD: You just have to be able to understand how to tie into those things too, because we always get the question… It’s a pretty long drawn out introduction when we call a place. We’re having this cabinet shop cut a bunch of material for us and they want to know what it is for. Whether or not you even have to explain to them what the pieces are for. They are used to cutting letters or cabinet doors. They are doing the same process over and over and they’re using the same material but it’s not a letter or it’s not a door. We’re trying to get them to realize that we’re not asking for anything different than what they do. It’s just maybe a different shape or a different thing. Sometimes we’re like, just let us worry about how it’s going to fit into something else. It depends on where the cost is. Some places you can just be like “Yeah I need this weird shape cut. Can you guys help us out?” And they don’t even ask and they just cut it and that’s it. But there are other times where it is more collaborative and we work with them to figure out how to do something. PC: How do you go about finding the different people to work with? Is it people that you just meet in passing? Or do you cold-call up a shop and introduce yourself? KD: It’s a bit of both. CB: Yeah, it’s a bit of both. Sometimes we’re just online and type in “cabinet shop Ann Arbor” (everyone laughs) and you get a list and you start calling. You cross off a bunch and then you suddenly develop a pool of people that can do it and you get a couple of people to price it and start building relationships. KD: Other times we’re just trying to figure out what’s local. Like Craig showing the butcher shop [in the lecture]. That guy knows where the cow came from. He knows where it was raised and then he butchers it. For us, we can just be driving around town and happen to drive by a place and be like, “Oh i wonder what they make there. I wonder how they do those things.” When you get a project you make a call, and you figure out who your neighbors are and what they make. There are a couple of people down the street from us. There is a guy that does metal working, there’s a sign shop and an artist’s studio. You realize that there are people around and you just have to know where to look. Usually it’s where the rent is a little cheaper (laughs) and around the edge of town. PC: At the University of Michigan there seems to be a lot of young talent there these days with you, PEG, and Mittnick Roddier Hicks and some of the other people that are teaching there. Is there something that is drawing people to Ann Arbor? Or is really just a freak occurrence? CB: It’s the weather. Everyone is drawn by the weather. (laughs) It’s 75 degrees everyday and sunny. It’s totally awesome. The beaches are a big draw. (laughs). PC: You actually brought the cold weather down with you to Sarasota. This is about as cold as it ever gets down here. CB: I think the school where we are right now is the draw. We have a really amazing faculty. There is a huge amount of design talent. Our chair, Tom Buresh, I think has been instrumental in cultivating that. He is supporting us, our practices, and the work that we’re doing. He’s helping us to figure out ways to make things more visible and allowing us room in our teaching to try to get at issues that we’re interested in, although we all want to more of that. But I think that we’ve been really lucky. There is a great comradery at the school. We all talk to each other. There are wide ranging and diverse opinions about education and the nature of practice and its pretty productive. PC: Some of the research project that you showed, like the concrete, is that something you’re doing in the office or as part of an independent study at the university or a little bit of both? 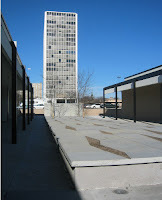 PC: Is that the kind of thing that happened between the concrete study and the Mies plaza in terms of the way that you were dealing with the precast slabs? KD: Yeah. I mean those were around, but it is not the only thing that lead to that. It wasn’t the only genesis of that. There were other discussions about how we do this, about how we cast these things. But because we had done that and tested a couple of things, we realized we can cast them, we can make some form work, we can do this. The early idea was to cast one on-site, cast the next against it and flip it over, then cast two on those tiles and flip those over. It was trying to use that book-matching strategy of Mies as casting one tile against the face of another and letting them multiply that way. We had developed that, but then we went the direction that we went. PC: You’ve referred to PLY as being a “research practice”. Is that the idea? You do some material research and then it eventually makes its way into a project? Can you talk a little bit about what you’re teaching, what you’re practicing and your research and the buildings? KD: Well, let me just start off explaining what research is a little bit. The way that calling it a research practice runs contrary to just a practice in general is that, I think, research has to be generalizable. It has to be applicable to other projects. We try in the best case to have each project deal with broader ambitions or broader goals than just solving the problems for that specific project. They may be material, but we’re starting to deal with more and more things like zoning. The competition projects deal with a kind of urbanism and how to research those things in order to find an urbanism in those places. And how to make something that has spatial consequences as well as social consequences within the context. That’s the first part. It has to be able to be in a broader context. Then, I think that anyone that talks about research also talks about the distribution of research and publishing those things or making those things known so that that plugs into a larger discussion of things as well. We’re in a constant dialogue with colleagues, with friends, with architects in other places. We’re open to a broader discussion and wanting to have a broader discussion instead of just focusing down and dealing with the project. We’re careful not just to characterize the research as a material research. There are other trajectories for us that we’re interested in doing. The difficulty that we’ve been talking about is how to link those different research trajectories and make it one seamless story and whether that is even necessary. CB: Right. The crisis recently has been a crisis of the narrative. We’re doing projects, there is a body of work that we didn’t even show today that doesn’t fit as neatly in the story that we were trying to tell today. There is a way, probably, to spin it. But it takes a little bit longer and given that we went three hours today… (laughs) We’re trying to struggle with how to bring this other work that we really like and are very proud of into the narrative of the other things. Part of it comes, I think, from being an academically oriented practice and wanting to tell that story and make the connections to articulate the research. If you can articulate the research then you can articulate that narrative and then you can tie the work together. I think that there are some moments that the more particular a project gets, the less it fits. It may even be a better project as a project than some of the research work, but we’re still struggling with how we want to tell the story. KD: For the most part it is residential. One of the bodies of work that wasn’t at all included today was the residential work. We’re trying to figure out if it’s because that is so intimately driven by the client and there desires. Although there was the Case Study house which tries to open that up and talk about those things. It’s the middle scale that we’re trying to weave that into. There is still an interest in materials and how those things are made. But maybe it’s that we can be contractors on commercial projects in Michigan and the studio that we just built was residential, but I was the homeowner, so that’s why I was able to be the contractor. But at the same time it’s not about wanting to build houses. It’s not about us trying to fabricate the houses, but we’re just struggling with how it fits together. PC: Can you talk a little bit about how PLY started? You started building the practice through competitions. How do you look at competitions strategically to build the practice from the ground up? KD: Well, we talked about this a little bit at lunch. If you want to do school projects, you can’t do a school unless you’ve done a school before. CB: That’s a big part in selecting what type of projects that we’re doing competitions for. It also gives us a way to jump scales in an interesting way. We’ve started a few competitions that were much more urban scaled, but we’ve lost our footing somewhere in the middle of those and we just haven’t finished any of them. I think that we’re moving back and forth. I think that the move to the next scale of construction for us was actually the first line of thinking that we developed together as partners and then it was actually the projects that pushed us into this realm of fabrication which I think is directly tied into the larger issues of industry and craft. Now we have a pretty significant body of built work at the scale of fabrication and part of the competition selection is to get us to the next scale of building where we can really talk about building systems and larger material assemblies and not just surface. So the studio that we’re running right now is geared directly toward that. We’re trying to get the students to work on it, but its also a vehicle for us to think about what we’re up to and to refine our process and thinking. Our teaching works in a similar way as the competitions some times which I think is a pretty interesting aspect of this whole juggling act that we go through. KD: Teaching is a way for us to think through the ideas. While ideally the competitions seem like a way to build qualifications for us to be able to do other projects. But it’s interesting to imagine that the competitions set up a methodology for us that then plugs right in to when we start to do material things. With the larger scale projects and competitions we are questioning how the things are made; whether its a butler building that is used to make a church or precast panels that are used to make a school. When we start doing a sushi restaurant, we interrogate it the same way and realize that given the time constraints and the budget we can do those things quicker rather than challenging a contractor to rethink the way that they’re making what they’re making. PC: What’s is one of the biggest challenges for you teaching full time and maintaining the practice? You’ve mentioned that after the Chicago Public Schools competition that you really had to formalize your office. Do you have a staff member in your office that takes care of the billing and administrative things? CB: No. We don’t. It falls on us. We do all of it. The biggest challenge is getting enough sleep. PC: So, it’s basically like working two forty hour jobs? CB: Well I wish they were just 40 hour jobs. (laughs) Somedays it feels like they’re endless. It’s definitely a challenge to balance all of this and keep the momentum going. Then there are the competitions. We’ve done five. Finished five in eight years. We’ve needed those years off in between just to recover. Because financially it’s a huge investment and a huge risk and there is so much energy put into them. The teaching has a pretty nice cycle. We get 4 months off in the summers. Kind of. But the everyday operation of a business can get pretty taxing too. When you sit down at your desk to draw something and it’s covered with bills that you have to deal with, it’s pretty hard to think about what the issues are and what you’re trying to draw. There’s a stack of messages that just came in while you were at studio and it’s 6:30 at night and you just got back to the office after teaching. It’s a grind, definitely. KD: Usually when we’re going to sit down and design something, which seems more rare as we go, it’s usually at night after the phone has stopped ringing and the employees have gone home that we can just sit down and talk about something and work through something. We’ve changed the make up of the office. At one point we thought that we could have someone with very little experience in the office because we were there and there was less overhead and issues like that. Now we’ve tried it a number of different ways and the best scenario is to have people that are pretty invested in what they’re doing and have some experience. Right now we have a pretty good range from someone that has 8 years of experience through to someone that just graduated from undergrad. So when we’re not there, it’s a lot like a design studio. We’ll come in and give some criticism and have them develop the project in a couple of different ways then come back and critique that. We give them freedom to be part of the project, but we give direction to it. So it is a lot like school. In the same way that we teach, I think that we’re not so heavy handed in terms of telling our students to do it exactly this way. What are the questions that we’re asking? What are you interested in? How do you develop these things? Here’s a couple avenues. Here’s a couple of precedents to look at to try to make sense out of all these things. CB: But to loop it back, the stronger and more articulate that we can be with the narrative and question of the research, the easier it is for someone to step in and help us because we have establish the set of ideas. Whereas in the design studio at school, I think that probably half of the time is spent figuring out what the narrative might be with the student. Allowing the student to have ownership in the direction of the project and the direction of their interests. Even though we might create an umbrella of issues that the studio is going to deal with, we leave a huge amount of leeway for the student to carve their own path within that. In the office, there’s a little bit less leeway because the stronger we can be with the narrative the tighter that gets. But at the same time it’s easier to let someone else help us with that if we trust them. For us we’ve found, a lot of times, that its really worth it to pay more for someone with more experience than to pay less for someone with less experience because they can understand what the goals are and work toward them in a much more efficient way. It doesn’t just balance it, it actually expands it. PC: So by having a continuity between projects, like you showed in the lecture today, where there is a continuous feedback loop of looking at different things, does that give you a way to show an employee where you’re coming from and where you’re going so that they have an idea of what you’re trying to do on the next project? KD: (laughing) Well, they gave us three hours. We didn’t take three hours. We expanded it because we had three hours. PC: How do you keep work coming in? You explained how you’ve used the new studio space and your website to weed out the projects that you don’t want to deal with. How do you keep the projects that you do want coming in? Do you do marketing? Or is there a steady flow of people coming to you because of your previous work? KD: We don’t do any marketing. CB: None at all. Except that we try to get all of the work published. It’s less a direct marketing and more an indirect marketing by being visible. KD: But that’s usually to other architects more than it is to potential clients. CB: It’s a little bit of both. A lot of it is just word of mouth. Our clients usually leave really happy and really enjoyed the work and they appreciated the process and they recommend us. That has gone a long way for us. We’ve had some absolutely dream clients. We still do. They are open to discussion, open to thinking, open to being challenged in their assumptions. And the best part is that they communicate that to their friends. We’ve had a really great success that way. The other part is that now we have some experience in stuff. A couple of restaurants, or at least interviews for restaurants, have come because they’ve seen a restaurant that we’ve done. They call us and we say, “Yeah, we can do restaurants.” A couple of those have ended really badly because they’re looking more at experience rather than the work. They’re thinking that because we’ve done a restaurant we can do any restaurant. They’re not looking at the restaurants that we’ve done sometimes. But at other times people are really excited by the forms, the space, the intensity of color, the richness of material that isn’t an expensive material but we get qualities that are way beyond the expectation. They give us some space to work and we end up in a collaboration with them. KD: It seems like the publications are less about marketing, as far as getting new clients, but it’s about a credential. Yeah, it’s just a little burrito restaurant but there must be something else going on because it’s been in five different publications. They start to look at that and see that more is actually going on and that it’s not just about answering those specific issues that they bring to the table, but it also puts it in a broader context. CB: I know that the guys are always surprised whenever they see their restaurant published. PC: In terms of the fabrication and design/build aspect of your work, it’s interesting, because a couple of weeks ago at our annual AIA Gala up in Tampa, we had Monica Ponce de Leon from Office dA as the keynote speaker. They did a lot of fabrication early on and someone in the audience asked the question “If you could go back knowing what you know now what would you do differently?” She said that they would stay away from fabrication and instead would find a different subcontractor that would do it for them. What’s your take on that? 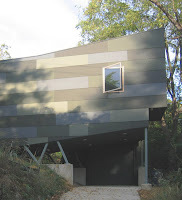 Do you foresee continuing to stay in the design/build side of things? Or are you doing it now just to get things built? KD: It’s probably a little bit of both. There was the immediate need of having to get things built, and we wanted to see things built, so we’d step in and we’d do it because we understood it. But I think that we’re transitioning to a point where it’s not about a complete level of control where we design it and we make it and it’s a closed loop. Now we’re having someone else make it and we work with them through that. But I don’t know that if we did it over again that we would give up those things. We learned so much from the direct interaction with the materials and with running the actual machines that make these things. That comes back in our work in different ways, so I wouldn’t want to give that up. But the difficulty is to be stuck doing that. It can limit the size of the firm and the projects that you do. It limits things that way. Instead, we’re trying to open those things up. CB: I was just thinking about writing a recipe without ever having cooked. That’s what architects do. (laughs) But there’s something pretty interesting about knowing more about the specific engagement. Knowing Office dA’s work, it’s pretty hard to imagine that they’d be where they are if they didn’t engage it as directly as they did at some point in their process. Not that they have to stay in that realm, but I think doing the construction and fabrication gives you a knowledge base that you can work from that is different than if you just conceptualize it. So many things that we just conceptualize, we never gain the full reality of the piece. I try to talk to students about when they’re working that there is a difference between thinking and architectural thought. If you’re thinking architecturally, you’re making something. You can’t just sit there and think through the thing and have it all worked out. So there’s a difference in what the value is in occasionally engaging the material directly and conceptualizing how to engage it. It produces two very different tactile worlds. I think that you have to be able to do both as an architect. I think you should be open to doing both as an architect. For us, we get frustrated sometimes by the slowness of having to do the work ourselves. But at the other end of it, there is so much that we learn in doing it that it advances the work the next time. I don’t know that I would ever want to completely give it up, but I can imagine that there is a moment when you know it well enough that you can predict it, or you can orchestrate it better. But I think that there is a difference. KD: So much of the discussion is about experience when you’re first starting out. I remember saying experience is what produces the same thing over and over again. What you’re struggling with when you start a firm is that you have essentially no experience that you can prove that is your firm or body of work. So you’re trying to build up credibility with these things. The publications help with that. The competitions help with that at a national level. The fabrication stuff has helped with that because we’ve taken contractors to spaces that we’ve built before and talked to them about what we are trying to do. That lends us some amount of credibility with the contractor because we understand where they’re coming from. We understand some of the issues. We understand what is going on with the materials. Then we can have a dialog with them. The conversation can be pretty stunted when we tell them that we want them to do this and they think that we’re coming out of left field and that we don’t have any experience with those things. We’re trying to use that experience. Like we talked about in the lecture, for us it’s never about trying to do the same thing over again, and quicker to make more money. It’s about trying to extend the last thing to the new thing while trying to innovate it and push it. With that the interview ended and I thanked them both for their time. They headed out to find Karl's family at the beach and then were off to see some of the Paul Rudolph work that is scattered around Sarasota. The Tampa Museum of Art is looking to temporarily relocate to West Tampa during the construction of the new museum. They are hoping to utilize the vacant Centro Espanol arguably one of the most historic buildings in Tampa. Hopefully the museum's opponents won't use this as an opportunity to suggest making the move permanent. Story in the St. Pete Times.